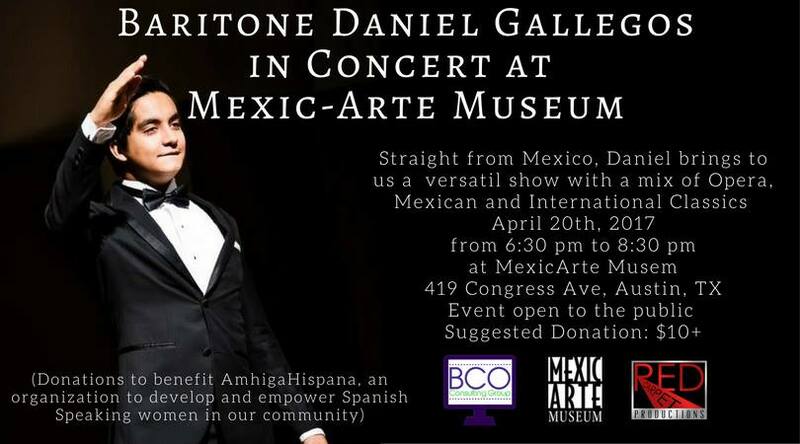 What: Mexican Baritone in Concert at Mexic-Arte Museum for a fundraiser for Amhiga Hispana organized by Mexic-Arte Museum, Red Carpet Productions and BCO Consulting Group. Daniel Gallegos is originally from Chihuahua, Mexico. He studied at the Music Conservatory of Chihuahua and the Taller de Opera in Sinaloa. He currently resides in Mexico City where he continues his studies at Sociedad Internacional de Valores al Arte Mexicano (SIVAM). He has received master classes and coaching from Armando Mora, Enrique Patrón de Rueda, Amelia Sierra, Bernardo Villalobos, Joan Domemann, Maureen O’Flynn, Genaro Sulvaran, Andre Dos Santos, Cesar Ulloa, Denise Masse, Vlad Iftinca, Angel Rodriguez, Teresa Rodriguez, among others. He has performed in the following operas: La Traviata (Baron Douphol), Gianni Schicchi (Pinellino y Betto), Falstaff, I Pagliacci, Die Zauberflote (Papageno), L’elisir d’amore (Balcore) and Carmen (Morales). Daniel won 4th place in the Concurso de Opera San Miguel 2016, and was a semifinalist in Concurso Nacional de Canto Carlo Morelli 2015 and the 7o Concurso Internacional de Canto Sinaloa 2015. Straight from Mexico, Daniel brings to us a versatile show with a mix of Opera, Mexican & International Classics such as Cielito Lindo, Aleluya, Dime Que Sí, Sombras, La Gloria Eres Tú, México Lindo y Querido, A Mi Manera, Granada, Júrame, Hermoso Cariño, Humo en los Ojos plus two operas.